Margarita Manterola (marga-9): And how does it work, to fix it manualy? Here is a little workaround for the time being. Put this is ~/.local/share/applications/ and set exec bit (chmod +x). Restart nautilus (kill and start again), and Media Player (CLI) should be added to the list of available applications. This is only a workaround and does not fix the problem at all. It does not even use the gmplayer frontend, just standard mplayer, so there is no GUI except the main window. Another manual workaround is to convert as root using ImageMagick all the PNG causing error in the folder /usr/share/mplayer/skins. Items have to be converted in the format PNG24 and renamed PNG after cancel the existing PNG. You have to do only with items causing error, not all. It's a bit annoying but it works for me and you have the mplayer-gui working. These also need the first command run on them. Paul Andreassen's workaround works for me. Thank you. Why would this be marked as "won't fix"? > Why would this be marked as "won't fix"? 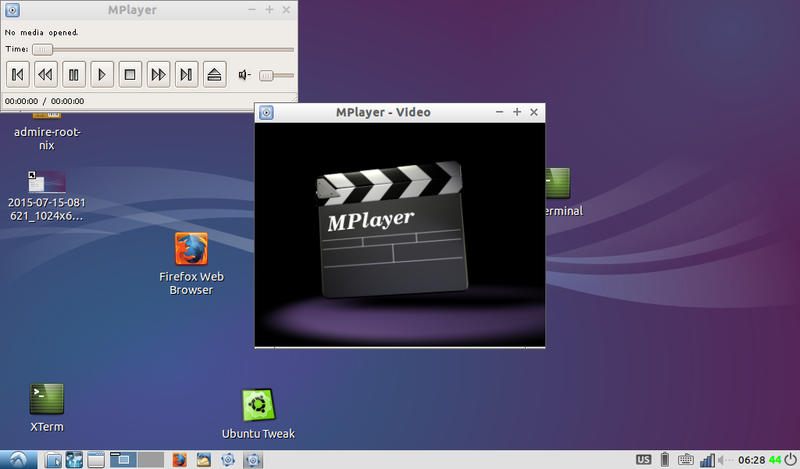 Because Debian/Ubuntu have recently dropped mplayer. So no source, no fix. [ws] display name: :0 => local display. I fired an Ubuntu-bug report on this. I hope it came through. I can't see it here. But I sent it here. How can you tell? I also hope very much that the bug gets fixed. mplayer is still the greatest media player. I miss it very much. The Paul Andreassen fix worked for me. Hurrah. Shame the bug won't get fixed. Have people given up on Linux now everything's going mobile? it's a bug in mplayer-gui, since mplayer as such obviously doesn't have this problem with other frontends. So if you don't want to mess with conversion, try umplayer from GetDeb (file/disc player) and gmusicplayer (jukebox). mplayer plays sound but no video. mplayer is returning to 16.04 with this still broken (as possibly worthless the gui is.. This is a show-stopper. Mplayer won't even start because of this bug. And Importance is set to Medium? REALLY? What kind of show are you guys running here? Why can't we just fix this real quick and release a new package? FYI I've downloaded a number of skins from mplayerhq.hu and they appear to be working OK. This bug is occurring for me - September 2016 - exactly as mentioned by people as far back as 2013. Tried workaround mentioned above by Paul Andreassen but didn't help. Also changed symlink of default from clearplayer to Blue but still not working. This problem can be solved in a very easy way: just rebuild and reupload the package. dh-strip-nondeterminism (aka strip-nondeterminism) has been introduced since then (18 Sep 2014). The current stripped versions of the files differ only by 2-5 bytes from their originals and seem to work. PS There is also a typo in the changelog: "tranitional" instead of "tran_s_itional". The new package http://de.archive.ubuntu.com/ubuntu/pool/multiverse/m/mplayer-skins/mplayer-skins_3.2build1_all.deb still doesn't work. The PNG files are stripped differently from the 3.2 version, but also differently from the package that I have built locally in a docker image (ubuntu:bionic) that works properly. Maybe, there is some problem with the build server configuration? New issue has resulted. Ubuntu Mate 16.04 for x64. Need to get 0 B/252 kB of archives.